William Martin was just 5 years old when he first noticed Studebaker automobiles. That’s when his Uncle came to visit the family in Maryland driving a brand new 1941 Studebaker. “That was the most beautiful car,” Martin remembers. 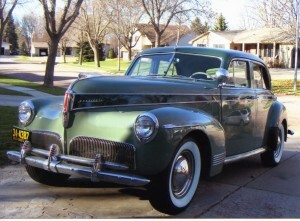 Fifty-eight years sped by before Martin, now living in Sioux Falls, S.D., happened across an ad offering for sale a 1941 Studebaker President Land Cruiser DeLux-Tone. Famed automotive designer Raymond Loewy created the elegantly formal Studebaker President Delux-Tone Land Cruiser that had a base price of $1,250 when new. Only 6,994 such models were manufactured. The designer eliminated the exposed running boards for a cleaner, more streamlined appearance. The ad rekindled recollection of his Uncle’s car, so Martin pursued the car ad. It was located in faraway Casper, Wyoming. Fortunately, at the time Martin’s son was working in that area and agreed to give the car a once-over. “He knows what’s good from bad,” Martin says. On his son’s approval, Martin bought the Studebaker sight-unseen in December 1999. A previous owner had started a restoration of the car by dismantling the interior, including disassembling all of the pieces of trim on the door panels. The trim pieces were not discarded, thankfully, but were left littering the cabin. “The Studebaker arrived on a trailer the day before Christmas 10 years ago,” Martin recalls. The 250-cubic-inch straight eight-cylinder engine with nine main bearings ran well enough to back the 3,500-pound car off the trailer and drive it into the garage. The odometer showed almost 60,000 miles. “The engine block was good, the interior was ratty, but there was no rust,” Martin says. Martin found the original two-tone green finish on his Studebaker had been covered with a coat of gray primer. The interior was reupholstered as close to the original fabric as possible Martin says. He then reattached all of the chrome and stainless steel trim. The three-speed manual synchromesh transmission has an overdrive function and the gear shift lever is mounted on the steering column. In addition to the heater below the dashboard, there is another heater under the front seat. The two-piece windshield is kept clear compliments of the two-speed electric wipers. Next came the task of stripping the outside of the car that stretches a hair under 18 feet long between the bumpers. With that job completed the car was sprayed in the original color of Light Mountain Green below the beltline while the top and sweep on both sides of the car were painted Dark Mountain Green. The 124.5-inch wheelbase is supported by a set of 7.00×16-inch white sidewall tires. Those wheels can be brought to a halt by the four-wheel hydraulic brakes, which are equipped with a hill-holder. The hill-holder couples the brake system and clutch to prevent the car from rolling back down hill when the clutch pedal is depressed. That was a convenient feature in pre-automatic transmission days. Under the prow-like hood Martin has rebuilt the generator, as well as the water pump and two-barrel Stromberg carburetor. Attached to the carburetor is an automatic choke. The gasoline tank has a capacity of 18 gallons. “The engine is powerful,” Martin says. He reports that the straight eight engine develops 117 horsepower at 4,000 rpm. Accessories on Martin’s Studebaker include the spotlight, AM radio and heaters. Other features are the bumper guards and trim rings on the wheels. “It’s absolutely loaded with chrome,” he says. Below the headlights, in the same bezel, are the small parking lights. In a nod to safety Martin has transformed those lights into turn signals to make multi-lane highway driving safer. “When I got the car it needed almost a total restoration,” he says. After nine-and-a-half years of work the job was basically completed in the summer of 2009.